Giant’s classic and timeless wedding invitations will simply never go out of style for they are the epitome of sophistication and sheer elegance. Our collection will charm your guests for an air of romance lies at the heart of each of the cards. Formal yet fanciful, the series is utterly divine and delicate. The beautifully handcrafted and professionally printed wedding stationary is for our true lovebirds who believe in a fairy-tale kind of love as it exudes nothing less than magic and marvelousness. Kissed in glamour and grace, your guests will be won over by a wedding card that they can hold onto forever. Take your time to peruse and pick the one that you and your partner will want to keep as a wedding memory years from now. 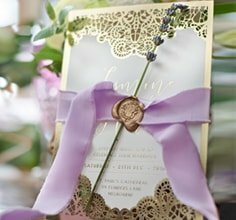 Softly and sleekly applied finishes and embellishments such as embossing, laser die cutting, Swarovski style crystals, pearl pieces, dreamy ribbons and wax seals adorn the invites for that extra special touch. Classically designed and effortlessly alluring, this selection is perfect for romantic and traditionally styled wedding. Handcrafted and made with love, this range has an enchanting understated charm and an everlasting appeal.